Pink Stars is a typical girly wordpress template suitable for a girl’s personal blog or alternatively for a blog about famous female stars, etc.. Overall this wordpress theme design is truly beautiful. Main content area is white while the rest of the page is pink. 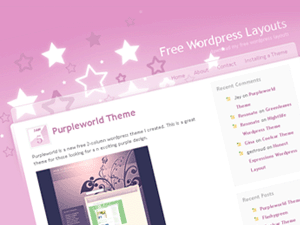 The header graphic is covered with white and violet stars. WP blog title and tagline are displayed in the upper right corner followed by page links. The sidebar is possitioned on the right hand side. Pink Stars wordpress theme was designed by MakeQuick.